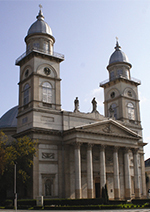 The Roman-Catholic cathedral was finished in 1830 and is a modification of a parish church from the 1780s. North of the cathedral, the bishop’s palace can be found. It was built in several instalments in the 1830s. One part of the palace holds the museum of religious art “Meszlényi Gyula”. Its collection contains a painting from 1760, which shows the journey of Swabians to Satu Mare: they travel downstream on the Danube on an “Ulmer Schachtel”, a traditional small wooden boat from Ulm; the painting shows the travellers as blessed by the Mother of God. On the same street, the “1. Decembrie 1918”, a Greek-Catholic church and the Romanian-Orthodox church “Assumption of Mary” can be found. The city’s art museum can be found in the old city centre in the former Vécsey House. Here, the Peace of Satu Mare was signed in 1711. 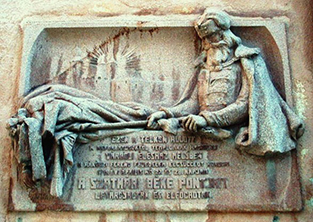 In the neo-gothic building’s courtyard, a relief by Aurel Popp, famous stone mason from Satu Mare, commemorating the Kuruc Wars can be found. After the peace of 1711, the region around Satu Mare was rebuilt and the depopulated areas resettled. The peace was initiated by Count Sándor Károlyi. Plate commemorating the Peace of Satu Mare. 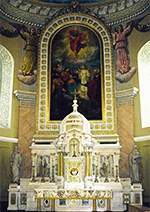 LEFT: Altar of Satu Mare’s cathedral. RIGHT: The Roman-Catholic cathedral of Satu Mare.